At the recently concluded 13th Japan Media Arts Festival artist David Bowen (whom we featured last November) won the grand prize in the art division. 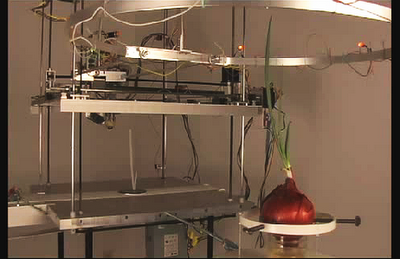 With a laser device for eyes, his Growth Modeling Device watches and reproduces the growth cycle of an onion as a beautiful, mechanical abomination. Click on the photo below to view a video of this kinetic installation.